...but he does admit his forecast last year was a bust so plenty of salt needs pinching. It's been the biggest question on my mind this past month; what's behind these strong positive NAO projections from GloSea5 and CFSv2? Something must be forcing that. They might be some of the strongest with the La Nina but I didn't think that necessarily corresponded to a +ve NAO-dominated winter. It is most puzzling! May not be worth worrying about though, given poor track records in recent winters, and the volatility of recent NWP output with respect to even the broader-scale patterns (apart from the mangled trop. vortex, which is itself a contributing factor to the variability at hand). Linked to ENSO forecasts? I’ve always assumed moderate to strong Nina = +NAO most of the time, but that is a gut reaction so maybe not based on strong evidence. 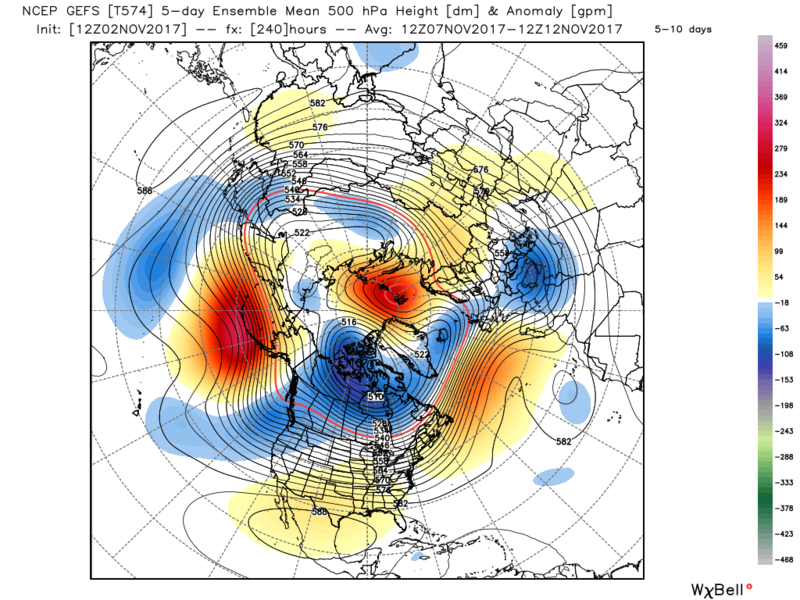 Ukmet seems to be forecasting a moderate Nina based on their October graphic. But that is a long way from certain. If Nina bottoms out not much lower than -1 and then returns towards neutral by the last third of winter then those +NAO forecasts may fade in time for the second half of winter. If Huffman is right and date line anomalies remain warmer than those further east then we should see more AAM kicking in, perhaps a stressed vortex in the second half and consequently greater chances for high lag blocking in late Jan onwards. The anomalies tonight continue to paint an interesting picture with a pretty fair agreement. 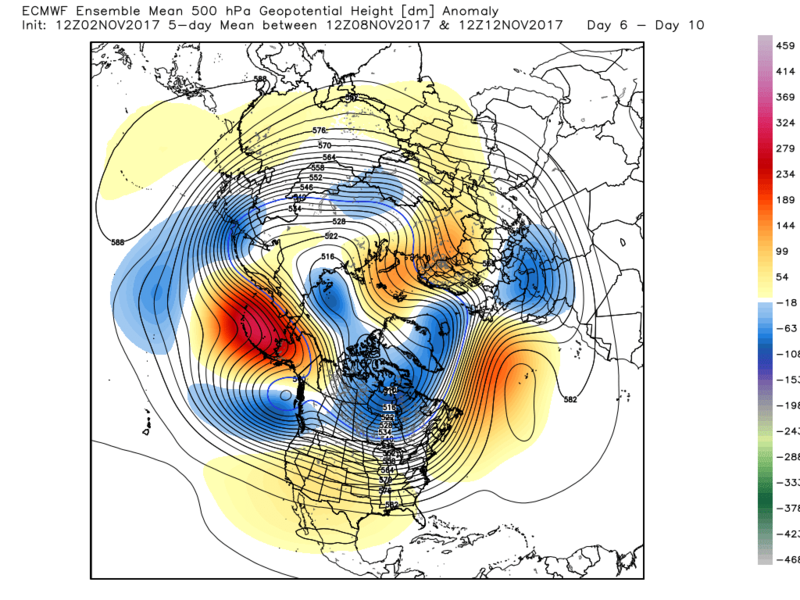 Upstream Aleutian/Alaskan ridge with a lively vortex N. Canada (Classic La Nina pattern without the Greenland block h/t MV) with associated trough south east to the UK and then south into southern Europe. It is combination of the latter with the ridging in the NE into Franz Joseph Land and the Azores high pressure pushing north in mid Atlantic which is of interest in our neck of the woods. Thus still a lot of energy winging east out of North America on a strong westerly upper flow south of Greenland but the flow will abate somewhat in the eastern Atlantic under the influence of the factors already mentioned. The det runs will need to sort the detail of this but with the trough introducing cooler air further south the percentage play would be low pressure to the south with settle conditions in the southern half of the UK with temps below average. The north could still cop systems tracking east on the jet. Having said that this is all dependent on the precise orientation of the major players but certainly not without interest. Mmmm many of the posts in the past few hours are not model discussion related - long range model forecasts for the winter ahead should not clog this thread up. Nor should discussion about what models have shown in recent years and how they performed, or which model is best..
Back to the models, no real change from yesterday, a generally mobile flow, but weaker than might be expected for November, allowing for height rises in the mid atlantic, and therefore some respites. A very typical late autumnal outlook, temps close to average, colder at times in the north, frost and fog in the mix..
Can we stick to the topic of the thread please.. 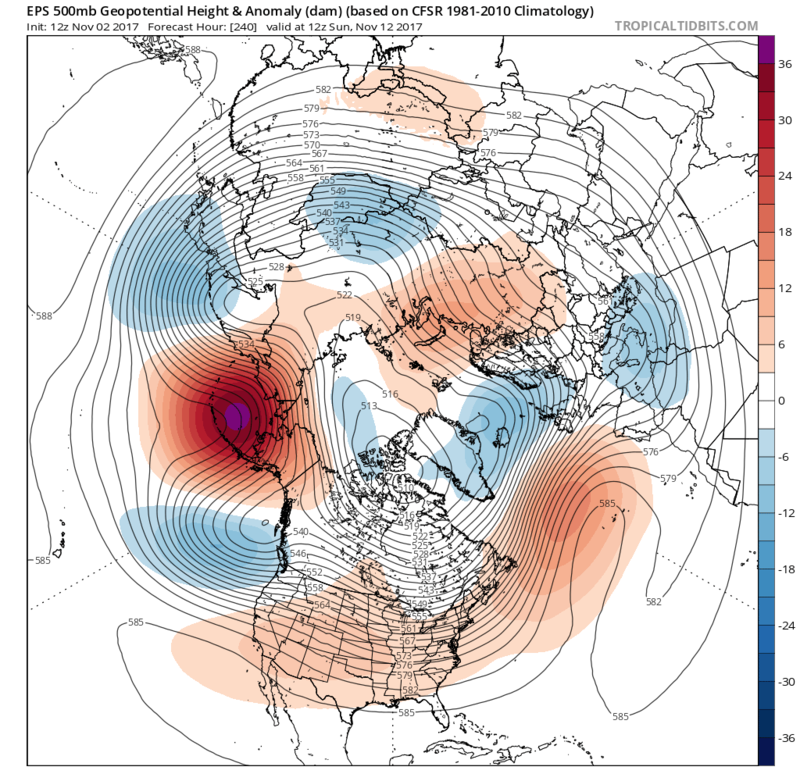 I'm correct in thinking a long range forecasting model is still a forecasting model? Moreover, the longer term NWP is interlinked with the nearer range so it's all fair game as far as I can comprehend. Maybe the thread should be renamed 'Short to medium range model output discussion'? At this point we’re not in an official La Niña although that’s expected to happen in the next few weeks.  I think much depends on how strong it is , a weaker one would be helpful for cold. Another thing to note and going back to one of my favourite subjects or as regulars might observe my MJO obsession it’s impact is effected by ENSO cycles. It’s normally at its strongest during neutral or weak La Niña , winter forecasts that rely on a strong La Niña might hit the buffers if that doesn’t verify. The last NCEP update had a weak La Niña forecast . Does anyone know if the ec46 has updated yet? my view isn't going to be until the morning although there are some links available around now. Quite. As I understand it, the MJO has less effect when there is a strong ENSO event as it is somewhat 'drowned out'. Saying that, last winter was fairly ENSO neutral and we were stuck in the doldrums somewhat. As for the longer range modelling, I don't think we can attribute the output to a strong nina forecast as the CFS seems to be at around the -1 figure. Historically, a value between -0.5 and -1 has been seen to be the magic value in terms of getting a cold winter. Seems to be something is over riding these telecommunications anyway, whether its +QBO -QBO la nina el nino it all ends in the same Atlantic in overdrive and a Greenland PV. Could it be the ocean temperatures? In particular the Atlantic. That low exiting the eastern seaboard is most likely going to scupper the chance of the azores high pulling west, seen it time and time and time again. Most probably the Pacific temperatures just off the west coast of USA/Canada. HP has been semi permanent there for the past few winters and is forecast there again this winter. Funny you mention that. I have noticed the mid Atlantic cold pool reappearing in the last few days. It certainly didn't help us over the last 3 or 4 years. Yes, possibly.Just watching the 18z and commented above crewe. 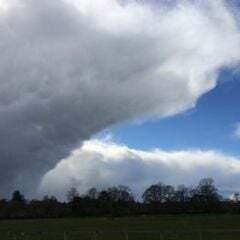 Yes my point - perhaps not put across well is as we enter the winter period, when the threads and forum come alive, it might be better to distinguish between short-medium model forecasting and longer range forecasting. Certainly discussing what long range models are showing for 3 months ahead should be relegated to a separate thread, so as to distill out the here and now. I often feel near-term model output discussion can get drowned out by what the models are showing 10 days ahead- short term developments than catch people out. Its fine to discuss thoughts and views on the themes and trends shown by the models - however, the thread can become quickly log jammed and as it remains open to far too much open-ended discussion.. It's having the effect of repeatedly sending cold down across Canada and the USA which is helping to form lows and firing up the jet stream as it heads out into the Atlantic sector. This in turn is preventing pressure rises where we need them and promoting pressure to rise across the continent. It's text book stuff and has been happening every winter for the past few years now. Followed by a slider with a Easterly. Looks like that low has gone and ruined the chance of an arctic northerly on this run..
Not often I comment on what one model is showing 8 days in advance - anyhow, what is interesting about the above chart is low pressure over Italy, someone called it he Genoa low, the azores high would most likely amplify I suspect increasing chances of something colder down the line. Its not the dreaded euro high scenario..
Omni present it seems. It's always there or there abouts in the model output. I think some have attributed it to the +PDO. I guess until this flips, we're stuck with it. 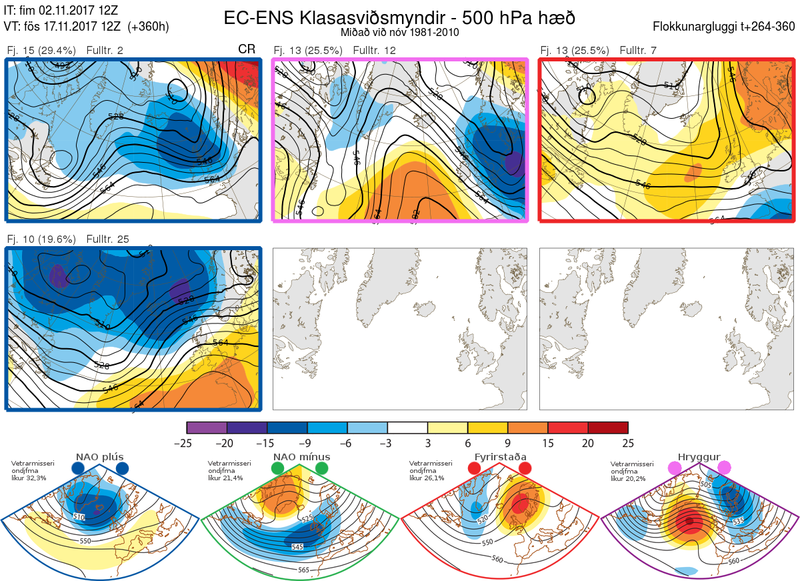 A look at the 12z EPS clusters, 12z EPS day 10 500mb mean, the updated EC46 and the CPC Prognostic 8-14 day 500mb heights/anomalies seem to broadly point to a westerly flow regime over the coming few weeks, but with potential for some brief northerly shots in there IMO. Yes i think you have a valid point concerning the PDO, dont think that being positive does any favours. 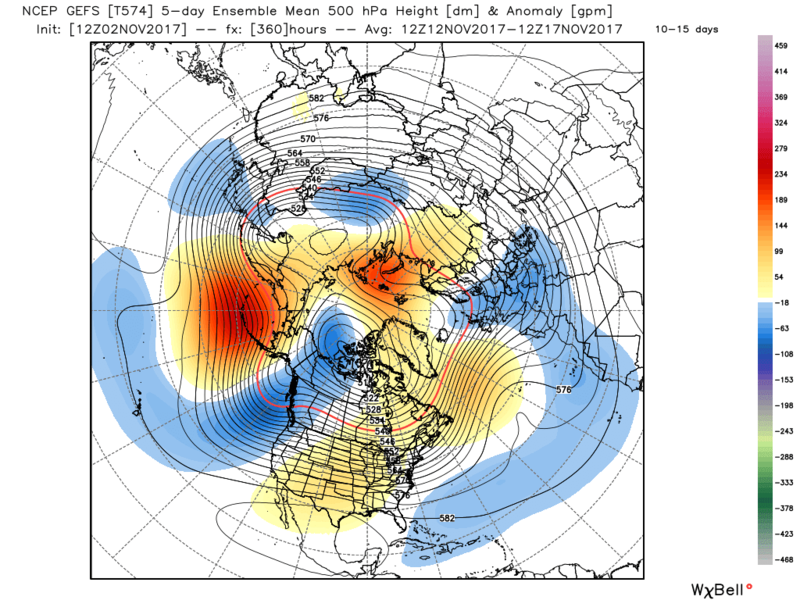 Latest ec 46 maintains the theme of euro low height anomoly later November and into December. 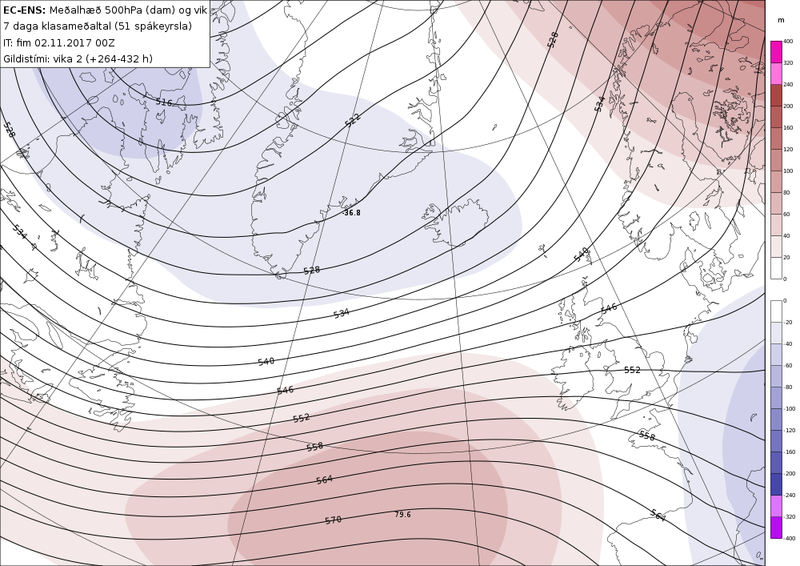 slight variation on previous run with the centre of the anomoly drifting north across the uk. overall, the vortex centred Baffin and stretching across to ne Siberia around the mean upper ridge n of the aleutians. Doesn't look like a strong zonal flow to me in that 3/6 week period but it isn't likely to verify without further runs repeating the same solution.